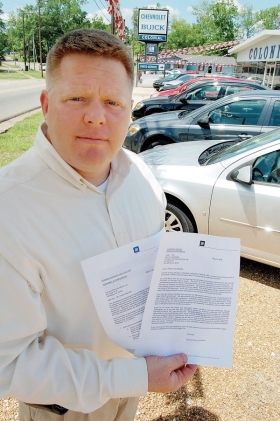 Phillip Alderman and his warning letter: "I'm tired of doing business with them." Many targeted GM dealers are pessimistic about keeping their dealerships.  If GM files for bankruptcy protection, the Bankruptcy Court judge has power to ignore dealers' contracts and legal protections.  Targeted dealerships lose customers and employees. Chevrolet dealer Phillip Alderman is appealing General Motors' decision not to renew his franchise agreement in late 2010, but he's holding out little hope. "I know the appeal is bull because GM's going to go bankrupt in two weeks anyhow," says Alderman, who owns Colonial Chevrolet-Buick in Talladega, Ala. Many dealers share his pessimism. Even though the current agreements of the 1,124 targeted dealerships last for another 11/2 years and GM is accepting appeals, some dealers have concluded that their businesses are viable for six months or less. First, Bankruptcy Court looms for GM. And slowly but surely, customers and employees will start leaving targeted dealerships. Also, GM is strongly defending the criteria used to pick the targeted dealerships. The U.S. Bankruptcy Code gives judges wide latitude to ignore contracts and other legal protections of parties doing business with bankrupt companies. So dealers targeted by GM can be axed quickly if GM files for Chapter 11 protection. GM CEO Fritz Henderson has said a GM filing is probable by June 1, the deadline given by the Obama administration's auto task force for GM to restructure on its own. By the end of next year, GM plans to reduce its dealership count from 5,969 stores as of May 15 to 3,600. That includes shedding Saturn, Saab and Hummer dealerships, voluntary dealership attrition and some GM-managed closings and consolidations. Dealer Ron Abercrombie, who got a termination letter from GM, says he'll appeal. He owns Abercrombie Chevrolet in Hartselle, Ala. He's not confident he'll win the appeal. "We see this as the final blow," Abercrombie says. He says he fears that if GM does go into bankruptcy, it might not buy back his stock of 48 unsold new vehicles. GM spokesman Pete Ternes says GM intends to repurchase any unsold stock, signs and special tools for dealers who terminate voluntarily. But in Bankruptcy Court, there's a possibility the judge could not require GM to do so, Ternes says. Lawyers confirm that in bankruptcy, GM might not be obligated to buy back unsold vehicles. GM has given dealers until June 1 to appeal. But GM's Jim Bunnell, executive director of the channel support group, says most dealers won't win. He says GM used a rigorous and fair formula to pick underperformers. "Certainly we're going to comply with all of the state laws," Bunnell told Automotive News. "We're very confident that the mechanism we used is a very good and very accurate reflection of the dealer's performance." GM judged a dealership's sales effectiveness, customer satisfaction scores, profitability and working capital. Mark LaNeve, GM's vice president of vehicle sales, service and marketing, says GM considers the warning letters it sent to the 1,124 dealerships to be final decisions. Indiana dealer Courtney Cole did not get a letter from GM. But she has little doubt what she would do if she had received one. "I'd be doing everything I could to wind it down fast," says Cole, owner of Hare Chevrolet in Noblesville. One GM dealer, who asked to not be named, got firsthand experience in closing a GM store in 1997. His advice for a dealer who got a warning letter is simple: "Scale down that operation to the bare bones, become a used-car dealer in that area and market his real estate," the dealer says. He learned that without a strong used-car operation, the dealership starts losing money, customers and its best employees in about six months. Alderman, who sold 125 new cars last year, wants GM to buy back the 28 unsold new vehicles he has and take his signs now. He says he will sell used cars as long as he can. "If GM would come get these new cars today, I would be done with them," Alderman says. "I'm tired of doing business with them anyway."